The OSCE mission in Ukraine has not registered any movement of military vehicles on the border between Russia and Ukraine, the group’s newly released statement says. The Organization for Security and Cooperation in Europe is speaking for the two Border Crossing Points (BCPs) it monitors - "Donetsk" and "Gukovo". “At the two BCPs the [Mission] did not observe military movement, apart from vehicles of the Russian Federation border guard service,” the report reads. The mission says overall border crossings have decreased at both the check-points. Moscow dismissed the accusations as absurd. 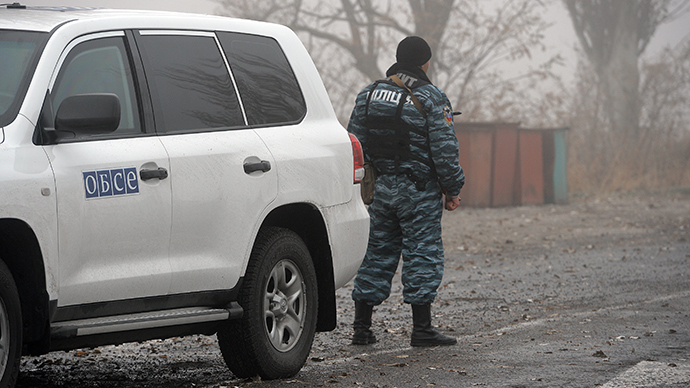 The OSCE does mention people in military-style clothing moving both to and from Ukraine. “The OT [observer team] observed 469 persons in military-style clothing crossing the border at the Donetsk BCP individually and in groups, 234 persons entered the Russian Federation while 235 left for Ukraine,” the report says. One battalion may usually consist of 300-800 troops with the least number of soldiers in a tank battalion - around 170 people. Russian Foreign Minister Sergey Lavrov denied on Wednesday allegations of a Russian military presence in southeastern Ukraine. He called on those who believe the opposite to prove their point. “I say it every time: if you are so sure in stating that, confirm it with facts. But no one can or wants to provide them,” he said.